Welcome to spring time! (For real this time.) After one late in the game snow storm, we are finally enjoying REAL sunshine and REAL temperatures in the 70’s, and I don’t plan to go back. This time when I hang up that big puffy coat, I want it to be for the last time. And you know what people eat when it’s spring time? They eat asparagus. 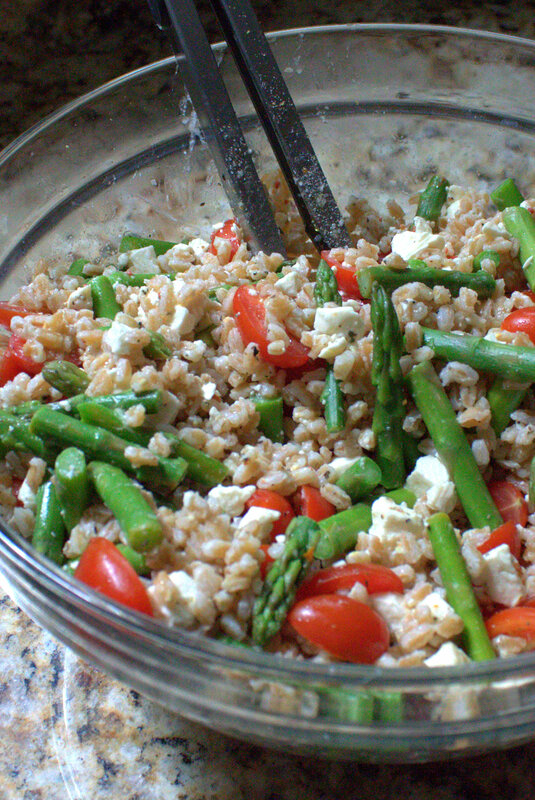 Which brings me to today’s topic, Farro Salad with Asparagus and Tomatoes. Whatever, I’ll do some next year. Let’s gather ingredients. This recipe is super easy because it doesn’t take much time, and there are only a few ingredients. 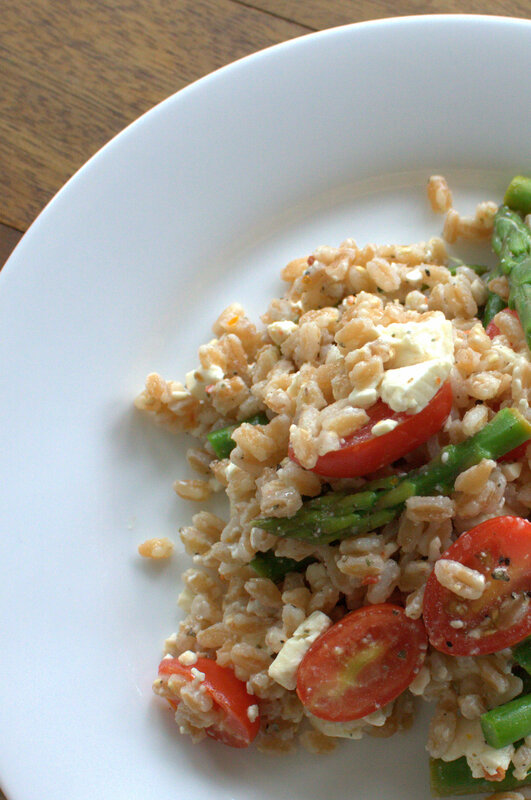 You’re gonna want to grab one bunch of asparagus, one lemon, one pint of grape tomatoes, 1 1/2 cups of pearled farro, one small container of crumbled feta cheese, olive oil, salt, and pepper. 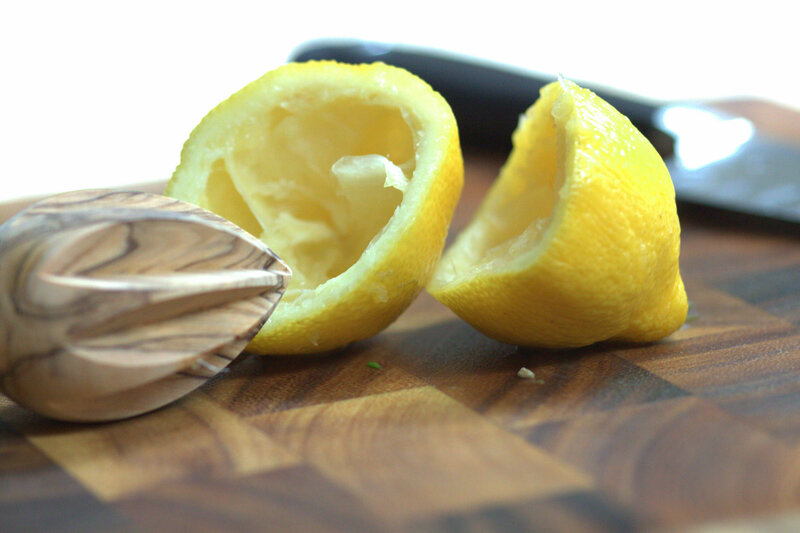 You can start anywhere you like, but squeezing the lemon isn’t a half bad choice. I learned that cooking farro is a lot like cooking rice. It has to cook for kind of a long time. I cooked this in boiling water for about 30 minutes. Perfect texture when it was all done! 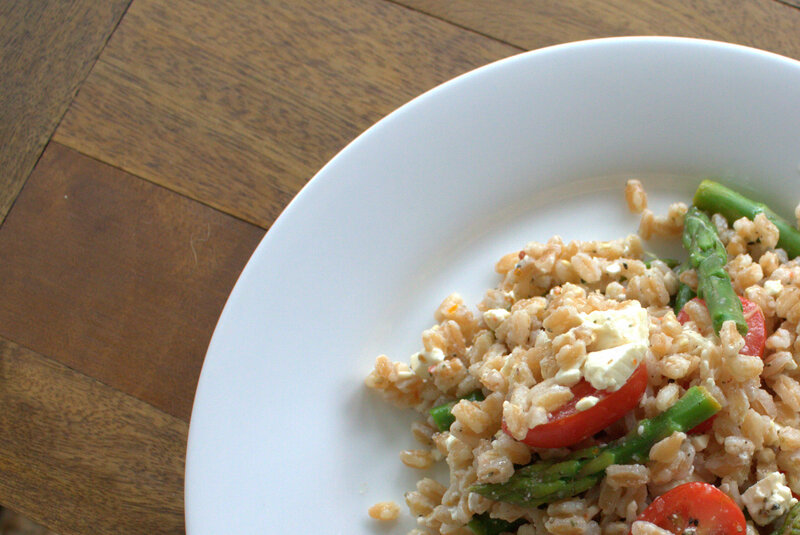 This salad resulted in what I’d consider to be a perfect balance of the chewy farro, salty feta, slightly crunchy steamed asparagus and sweet little tomatoes. A little light dressing from the lemon juice, olive oil, salt, and pepper gives it just enough flavor. I’ve decided that I shall make this a lot this year. 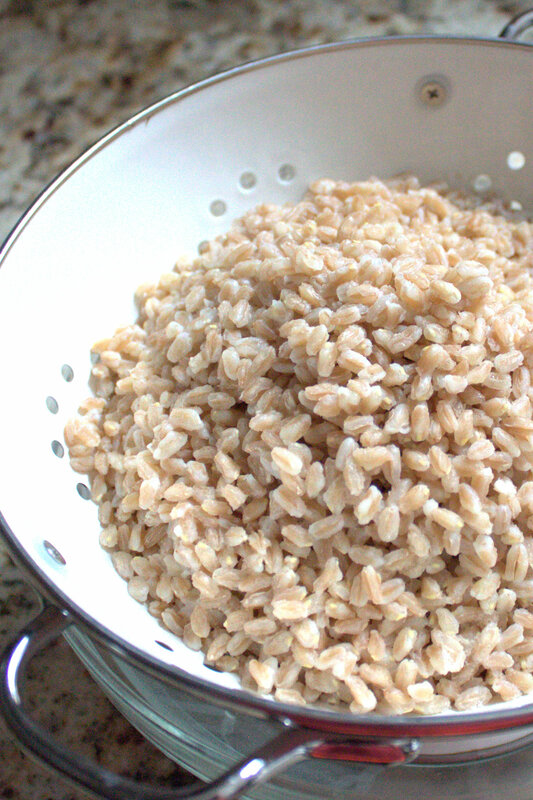 Boil the farro in a pot of salted water for 30 minutes and drain. 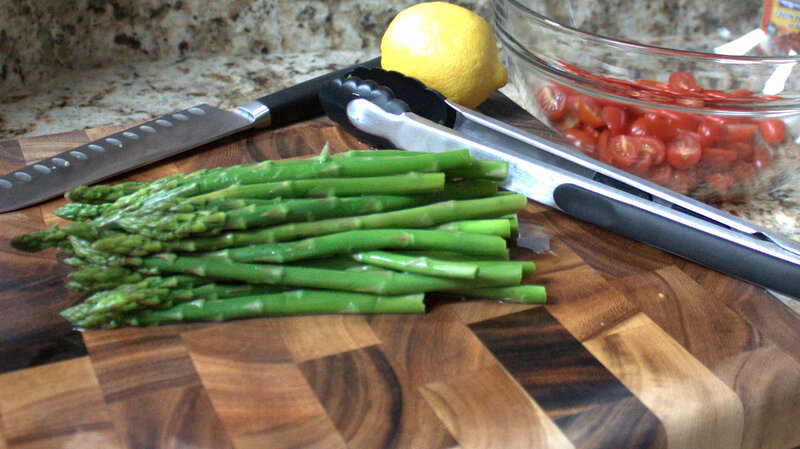 Steam asparagus for about 4-5 minutes, then shock in ice water to stop cooking. Cut into bite sized pieces. 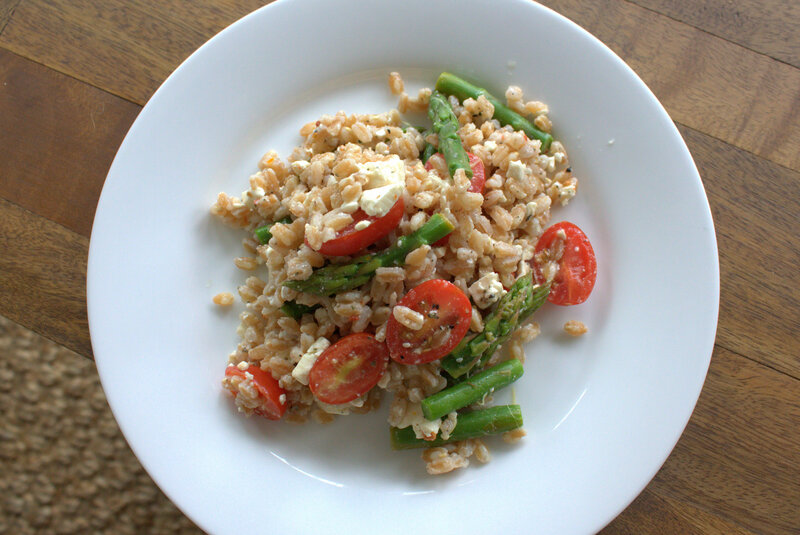 Toss cooked farro, steamed asparagus pieces, tomatoes, and feta with lemon juice, a drizzle of olive oil, and salt and pepper to taste.